The first session with the cast was a little talky. There was a lot to introduce before the project could start in earnest. I’m working with actor/performers who have had no experience of performing magic, other than performing the odd trick for friends and family. So that’s where we started, each company member performs a trick. This is raw trickster magic. The tricks performed were as short and punchy as you would expect, with everyone keen to see the work as a puzzle to solve. We, of course, are aiming to go beyond that, but from this starting place we could look as tricking the audience, giving them a puzzle, and we could also look at failure. Some tricks went wrong, I expected that, but we were able to examine that failure. What is different in performing magic, than simply acting? What are all the different things you have to do besides act? Then there was a more formal presentation as to what Bizarre Magick is (and isn’t) and how it fits into the continuum (if there is a continuum) of the magic assemblage (if Simon During is right about there being a magic assemblage). The session ended with a long discussion on Ethics, belief and some ground rules to work by as we move through the rehearsal process. 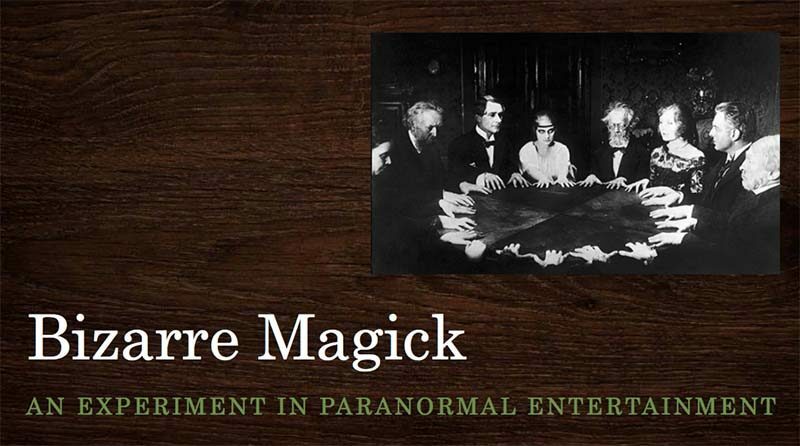 The second session of the work was devoted to Séance. Firstly. I performed a séance act for them. Broadly following the dramaturgy I discuss in ‘Impersonating Spirits: The Paranormal Entertainer and the Dramaturgy of the Gothic Séance’, and incorporating all the classics. This was followed by an extended session breaking down the methods and practices used. I found this a really interesting process as I have never performed and then carefully explained and deconstructed that experience with the attending audience. I wouldn’t, of course, do this with Muggles, so be assured all present had taken ‘the oath’. Next week – Divination and Super Sparkle Action Princess GX!